Before you can use error handling, you need to understand the Error Trapping setting. VB6/VBA lets you to determine how it should behave when errors are encountered. From the module editor (IDE), look under the Tools Options setting. 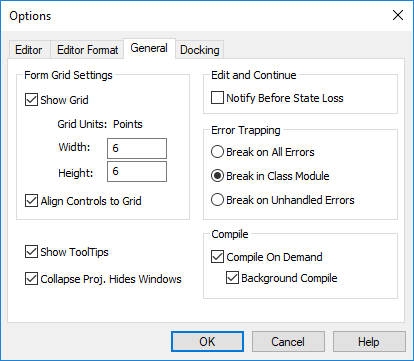 We recommend using "Break in Class Modules" which stops on the actual crashing line. However, be aware that this does not work if you use raise errors in your classes via the Err.Raise command. This command actually causes an "error" and makes your program stop if Error Trapping is set to "Break in Class Modules".
' Copyright (c) FMS, Inc.
'           This should be called when the program starts and ends.
' On Error Resume Next code to fail. Const cstrOptionErrorTrapping As String = "Error Trapping"
' Do not reset error trapping if the static variable has been reset.